Amy Houston, left, speaks at the Martire Forum. 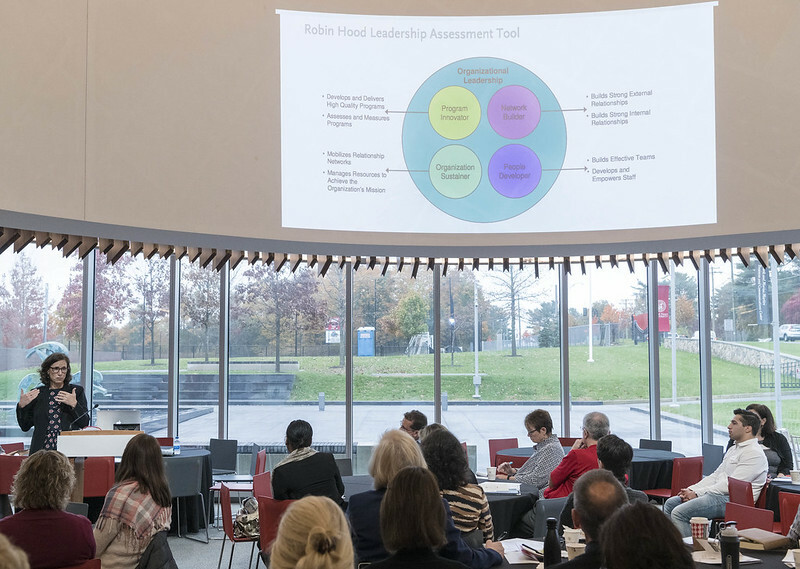 Recognizing that many nonprofit groups are struggling to survive after years of state funding cuts, Sacred Heart University recently conducted a conference to explore ways to help them overcome their challenges. Other reasons for the challenges are increased demand for services and fewer donations. All these reasons are forcing nonprofits to do more with less. Much like for-profit businesses, nonprofits need to learn how to most effectively use their available resources. This often requires creative and/or hard-nosed business decisions if they are to thrive. The conference, which took place in the Forum at Sacred Heart University’s Frank and Marisa Martire Business & Communications Center, aimed to help nonprofits overcome their challenges and succeed in the hardest of times. “From Surviving to Thriving: Navigating Today’s Management and Financial Challenges” attracted about 100 leaders of local and regional nonprofits in health care, education, social services and the arts. The event was presented by SHU’s Center for Nonprofits (CFNP) and the Master in Public Administration program. The CFNP helps identify nonprofit groups with business needs that can be addressed by students in SHU’s MBA programs pro bono. The MPA program, directed by Lesley DeNardis, is geared for candidates seeking public or nonprofit sector career placement or advancement. DeNardis kicked off the conference with a welcome, joined by Paul D’Andrea, CFNP director. University President John Petillo also welcomed participants, stressing the importance of the nonprofit sector to the University and the long and ongoing relationship between the two through educational and volunteer programs. Notably, in the past academic year alone, SHU faculty, students and staff contributed more than 100,000 hours in community engagement, he said. Amy Houston, an adjunct faculty member at Columbia Business School, was the keynote speaker. She teaches a course on high-performing nonprofits and, on a wider level, she provides strategy consulting to nonprofits and foundations. She formerly ran management assistance and administrative operations at the Robin Hood Foundation, which targets poverty in New York City by finding, funding and partnering with the most effective poverty-fighting organizations to help them best achieve results. Houston offered topline thoughts about effectively managing a nonprofit by focusing on strategy, operational excellence and collaboration. Of particular interest to audience members, who often work with limited funds, she addressed response, innovation and continuing a mission when forced to do more with less. Her advice was to make the difficult strategic decision of aligning available funds with achieving the nonprofit’s mission and measuring results of their efforts to ensure funds are allocated properly. Houston also emphasized managing talent, leveraging technology and communicating clearly, and she asserted that groups that excel in these areas will succeed even in difficult times. Finally, she recommended that groups be open to partnering with others as a way to strengthen their own organizations. Following Houston’s address, participants attended breakout sessions, including “Organizational Forms,” moderated by William J. Hass, executive-in-residence for SHU’s MPA Program and featuring panelists Alyssa Goduti, president and CEO, Connecticut Council of Family Services Agencies; and Patrick Johnson, former president and CEO of Oakhill School. The presenters discussed alternate organizational structures designed to meet the challenges of today’s nonprofit world and shared their experiences with mergers, collaborations and various partnerships that increased their organization’s effectiveness. DeNardis led a session titled “Implementing Change,” with panelist Bob Arnold, president and CEO of Family Centers. Their presentation highlighted strategies to build support for organizational change among boards, donors and staff of nonprofit groups and offered effective implementation strategies. Stephen Brown, professor emeritus of management and former CFNP director, led a session on “Planning for Sustainability.” He was joined by Debra Greenwood, CEO and president of the Center for Family Justice and advisory board member for the CFNP. This team discussed strategic planning for nonprofits, including how to fulfill the organization’s mission with limited resources. The duo also addressed the decision to expand, consolidate and potentially reinvent a nonprofit and how services can be evaluated in the planning process.